All day Wednesday and Thursday morning, Kingsland members brought coats, blankets, gloves, hats, thermal garments, flannel shirts, socks, and shoes to the church. On Thursday morning, volunteers sorted the items and packed them into large boxes. 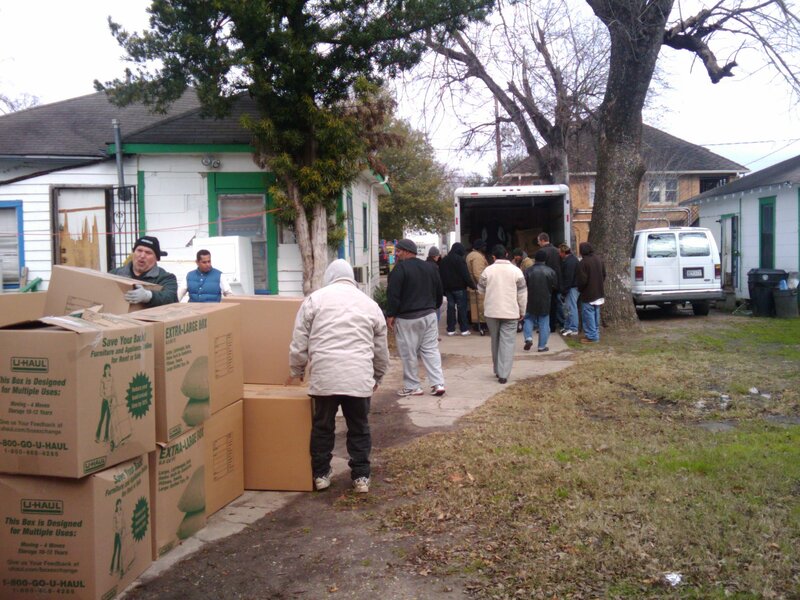 By 11:00 AM we had completely filled a twenty-four foot U-Haul truck with boxes bulging with warmth. And, we gave an additional ten boxes of coats and blankets to Bhutanese refugees and set aside several coats for local day laborers. We delivered the items to David’s home base in Houston’s Third Ward where a dozen men helped us unload the boxes. When all of the boxes were unloaded and stacked, we stood in a circle, held hands, and prayed together. We asked that no person would suffer and die in the cold. After we prayed, the men expressed their personal gratitude for Kingsland’s warmth. David’s men then met to discuss their distribution strategy. I am deeply grateful to the people of Kingsland for their amazing response to this need. Our folks provided 394 blankets, 466 coats for men, and 546 coats for women. We also filled 8 large boxes with thermals, hats, socks, gloves, and scarves. So, because of the kindness of our Kingsland family, many people will be able to stay a little warmer through the coldest days Houston has seen in fourteen years. We have done for “the least of these” what Jesus would do. I have received several encouraging e-mails about our “warmth initiative.” I love what one person wrote, “I am not able to take part in mission trips so I was thrilled that this was something I was able to do for those less fortunate than myself. Yesterday morning as I dropped off the coats and blankets, I thanked God for my warm coat and warm house that I have been blessed with. I truly felt like I was able to do what God asks us to do to help others.” This kind and thoughtful individual reminds us all that we don’t always have to travel far to do good. We just have to be willing to respond to the needs of others in a compassionate and intentional way. Thanks Kingsland, for being a warm and caring fellowship of Christ-followers who love God and love others. Thank you for setting the example and putting thoughts into action!